Israel has struck four targets in Syria this year, according to international media reports, hitting shipments of Iranian and Russian weapons that were– or were about to be – moved to Hizballah's possession in Lebanon. The most recent reported attack occurred on July 5 in Latakia, allegedly targeting advanced Russian surface to sea missiles. The chaos and carnage of the Syrian civil war is a conflict Israel would like to avoid, but Israeli leaders have stated that any attempts by Hizballah to exploit the situation to import advanced arms, such as guided missiles that can threaten Israeli population centers and strategically sensitive targets, are a red line Jerusalem will not accept. Low signature strikes, if they occurred, are ways for Israel to take pinpoint action to protect its national security, without getting dragged into a wider conflict. Officially, Israel has neither confirmed nor denied these strikes, apparently in order to avoid placing the Assad regime in a position where it feels it must retaliate. Indeed, plausible deniability, and a wish to avoid opening a second front in the midst of a civil war, have allowed Assad to ignore the alleged strikes, with the exception of isolated border incidents and a threat to retaliate to future strikes. Yet, some in the United States seem not to share Jerusalem's reported desire to keep the strikes low profile, and have gone on record to leak details of the incidents. Such leaks cannot be good for Israel, whether the sources intended to cause harm or not. In a series of U.S. media reports, unnamed American sources have provided information on alleged Israel Air Force strikes in Syria. 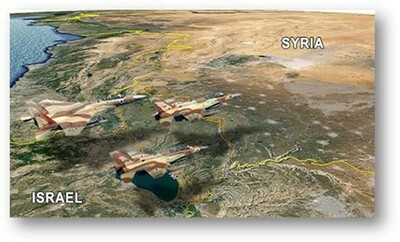 Most recently, sources described as "intelligence analysts" told the New York Times that the July 5 Latakia strike did not succeed in destroying all of the Russian missiles it targeted, that Assad ordered his army to set fire to the site to try and hide that fact, and that another attack will be needed to complete the mission. Previously, sources described as American officials told the New York Times Israel carried out the Latakia strike. In May, an anonymous American official said Israel targeted Iranian Fateh 110 missiles in Damascus air strikes. These sorts of reports have caused puzzlement and confusion among Israeli observers. Who is behind these leaks, and what are their motivations? The world of intelligence is murky and confusing, and it is difficult to draw clear conclusions. Some observers have suggested that someone with high-level intelligence is concerned that the reported strikes may lead to an all-out Israeli-Syrian conflict. The latest New York Times report effectively provided Assad with an early warning, and instructed him to expect a further strike, thereby sabotaging a potential mission. These reports raise rather disturbing questions about the nature of the cooperation between the intelligence establishments of the two countries. To be sure, Israeli officials adamantly maintain that overall defense cooperation with the U.S. has never been better. From missile defense exercises to joint air force drills, and in many other areas, the two militaries work closely together in a fruitful relationship, as the remainder of the Middle East faces anarchy and extremism. While the big picture on cooperation is encouraging, a few pixels on the screen don't seem to be quite in line with the rest of the image. Efraim Inbar, director of the Begin-Sadat Center for Strategic Studies at Bar Ilan University, stated that "the mere fact that such leaks happen often indicates that the Pentagon leadership does not have Israel's interests at heart." Inbar acknowledged the difficulties outside observers have in attributing motive for the leaks. He listed several potential causes, beginning with the most apparent one: The wish to prevent future Israeli strikes. That apparent leak could be part of a larger objection to the Israeli strikes among some quarters in the Pentagon. It is possible that the Pentagon is split into two camps – one opposed to U.S. intervention in Syria, a position formulated by the Joint Chiefs of Staff Chairman Gen. Martin Dempsey and adopted by the White House – and another camp favoring intervention, a stance promoted by Secretary of State John Kerry. The anti-intervention camp might be concerned that the alleged strikes risk sparking a larger-scale conflict, which could force American involvement. But it is just as conceivable that the pro-intervention camp is behind the leaks, using them to embarrass those who argue that an American intervention in Syria would require many sorties, would be complex, and holds no guarantee of improving the situation. By pointing to alleged Israeli strikes, the interventionists may be trying to show that taking action in Syria is not as difficult as the rival camp suggests. Lastly, Inbar said, the reports might be little more than the product of a will by sources in the Pentagon to maintain a good relationship with the media. "What is clear is that they do not come from elements friendly to Israel, because Israel's preferred modus operandi is low profile. [This is] intended to allow Assad to refrain from reacting," Inbar said. A second security expert said he is reasonably certain that the leaks did not come directly from the Obama administration, and doubted that they resulted from an official Pentagon directive to share the information with the media. "Coordination with the U.S. administration now is better than in the past," said Dan Scheuftan, director of the National Security Studies Center at the University of Haifa. At the same time, he noted, U.S. intelligence has played risky games in the past to influence political decisions. He recounted the 2007 National Intelligence Estimate, which claimed that Iran froze its nuclear program, as a politicized assessment designed to dissuade former President George W. Bush from launching strikes on Iran. "U.S. intelligence has played very dangerous games in the political field. I can't rule out someone in U.S. intelligence as a possibility," Scheuftan said. "There could be elements within American intelligence that are interested in damaging Israel, or promoting a certain policy," he added. The leakers, whoever they are, could be creating real harm for Israel's overall policy of keeping advanced arms from reaching Iran's proxy terrorist group in Lebanon. That's a problem for American officials to address regardless of whether that harm is deliberate or inadvertent. Next week, Dempsey arrives in Israel for talks with Israeli leaders. A recent article in the Israeli daily Yedioth Ahronoth proposed that among the burning issues of Iran and Syria, talks will also be held to "smooth over the issue of alleged leaks." In light of the fact that cooperation with the U.S. is one of Israel's most critical strategic assets, perhaps Dempsey's visit will be an opportunity for both sides to deal with the alleged leaks constructively, while focusing on the many joint security challenges faced by both countries, and continuing the already superb cooperation that is in place.